After another rough start in which Anibal Sanchez allowed eight hits, two walks, and three home runs against a rather limited Angels offense, we find ourselves at a crossroads. I would typically prefer not to lean on a cliche for this kind of thing, but sometimes cliches exist because they capture an enduring condition. Anibal Sanchez is pitching poorly, he’s being pitching poorly for quite some time, and the Tigers have an opportunity to change direction now that Fulmer, Norris, Boyd, and Greene are all legitimate rotation options. With Verlander being Verlander and Zimmermann ready to come back, there is an out for Sanchez. It’s time. I’ve written about this and I’ve tweeted about it even more. 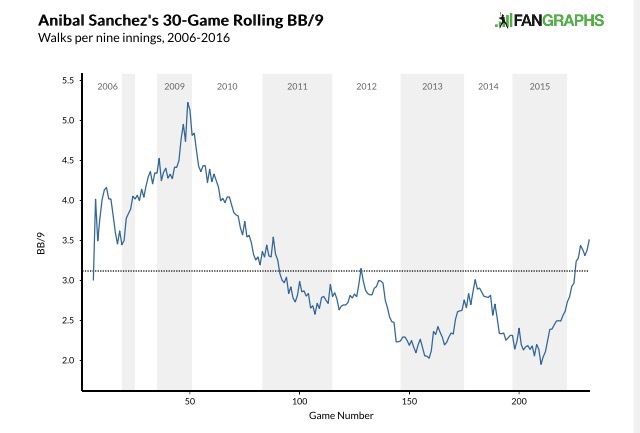 Anibal Sanchez isn’t flashing the same stuff he did when he was an ace, but I still maintain that his stuff is still mostly there. This isn’t a question of vanished velocity or a lack of movement overall, it’s about a lack of execution that has become too frequent to ignore. While it’s hard to diagnose the precise cause of his troubles, the method of failure is obvious. 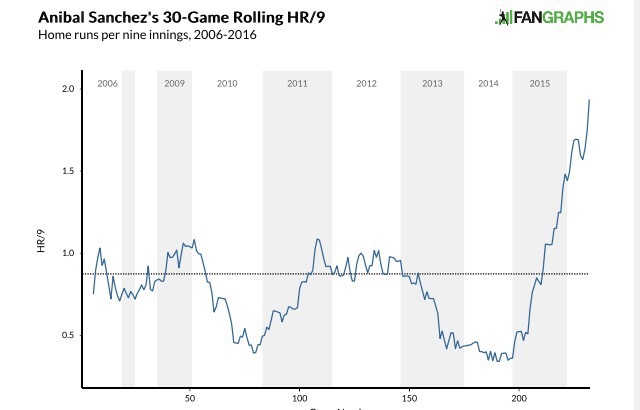 During Sanchez’s best seasons, he was preventing home runs at an elite rate. No one expected that to continue, but the way in which it has failed to continue is extraordinary. The chart shows a 30-game rolling average of his HR/9 by game. So the last point is his last 30 starts, the point at Game 150 is for career games 120-150, etc. The home run problem has exploded. Home runs are funny. Most of the time, pitches influence whether they allow long fly balls, but the rate at which they clear the fence is pretty random. You can be homer prone, but even the worst pitchers don’t give up that many. Dingers are noisy and so when the problem started at the beginning of last year, it was easy for me to dismiss as one of those weird things. After all, the stuff looked fine. But it kept happening. And now lately he’s been walking batters at an alarming rate. The walk rate isn’t unprecedented like his HR rate, but they’re climbing back to pre-ace levels. You can walk batters in the show, but you can’t walk them if you’re also giving up a ton of HR. There’s no path forward for a pitcher like that. Sanchez says he’s healthy and given how poorly he’s pitched, it would be easy to blame an injury if one was lurking at all. He’s not at peak velocity, but he’s at a workable velocity and he still gets break on his pitches. He’s just throwing too many bad pitches mixed in with the normal ones. At first you chalk it up to the randomness of baseball and clustering, but we’re 40 or so starts deep into this run. It’s time to worry. Sanchez has indicated some of this is mental. I try not to psychoanalyze players, but if he’s offering it as an explanation I’ll give it credence. Sanchez has given the Tigers about 10 WAR during this contract and even if he never pitches for them again it won’t be much of a loss. This isn’t about salvaging a disasterous contract or wishing the club had gone another direction, it’s about finding a way to get Sanchez back to useful status. The best path is probably to send him to the bullpen. Tell him to focus on preparing for 3-6 batters per outing and try to give him a schedule. Let him concentrate on a small task and work back up to longer outings. At worst, he’ll offer some bullpen depth and at best it will give him a chance to reset himself without the pressure of going 6-7 inning each time. It might not work, but it’s better than sending him to Toledo to pitch against inferior opponents with low stakes. Sanchez has been one of my favorite players since he arrived on Detroit and had previously been the recipient of one of my Twitter things. It’s been hard to watch the wheels fall off over the last year and a half, but there’s really no way to ignore it anymore. The best thing for him and the team is to move him to the bullpen and hope that we haven’t seen the final Anibal Sanchez Night in America. “but it’s better than sending him to Toledo to pitch against inferior opponents with low stakes.” I disagree. At this point, sending him out there in anything other than a mop up role significantly decreases the Tigers’ chance of winning–he is almost as terrible the first time through the order as he is in the middle innings. 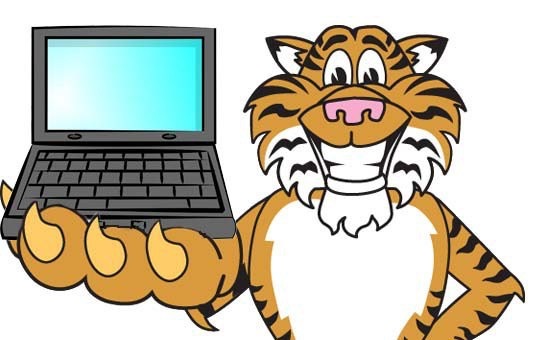 And unless the Tigers are going to reprise last season’s face plant, there won’t be enough mop up situations for him to get untracked, So the place for him to figure things out for now, I would argue, is Toledo.